Audioholics is currently compiling a list for the ultimate subwoofer shootout. There are no limitations in price or size. Both sealed and ported designs will be in the testing and compared against one another. In the initial list the EP800 is slated. This is all subject to change. This is certainly exciting for Axiomites! This is Gene's list, but looks like an "invitation". He states first 5-6 companies to submit their product will be tested. Hopefully we will see entries from those listed. Its just a starting list as I pointed out and subject to change. Subwoofers that are not on the list can be added as well. It seems Axiom will be getting an initial invitation to participate if they want. Either way, there are going to be some elite products being tested here. The results will be interesting in a shootout like this and should be fun following it, whatever ends up being tested. There is not much informaton on the EP800 since its a new product, so for the EP800 owners out there and individuals looking for new subs, it would be really special. I would love to see the EP800 in the ring, and it would be great to see all of those others represented as well. Me too. There is a lot potential in the initial list. What I am the most interested in if there will be correlation to the objective measurements and subjective listening evaluations. Hopefully, the subjective listening is done blind. About 4 of the links are broken. One sub that they should add might be hard to beat is the Martin Logan Descent i! After all, how can you compete with this . . .
Crave a little heavy-metal thunder from time to time? 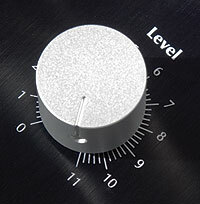 Ordinary level controls top out at '10'; ours goes to '11'! I've had my eye on the Epik subs for a while. I'm curious how they do. Yeah, but they stopped making their top of the line sub, the Conquest.